A new drug with the potential to reverse resistance to immunotherapy has been developed by scientists at the University of Southampton. It has shown great promise in pre-clinical models and will be available to patients with certain leukaemias and non-Hodgkin lymphomas in clinical trials later this year. Targeted drugs made from engineered immune proteins – called monoclonal antibodies – have revolutionised treatment for several types of cancer in recent years. They work by sticking to specific proteins found on the surface of cancer cells, flagging them up to be killed by the immune system. Unfortunately, a number of patients do not respond or develop resistance to treatment. The findings, published online today (13 April 2015) in the journal Cancer Cell, show that resistance to many types of antibody drugs can be overcome by preventing cancer cells from ‘hiding’ from immune cells. The research was carried out by scientists at the University of Southampton and Swedish biotech company, BioInvent International. The researchers, who were funded by Leukaemia & Lymphoma Research and Cancer Research UK, have shown that some cancer cells are able to draw monoclonal antibodies inside themselves, making them invisible to immune cells. However, the researchers showed that a new antibody, called BI-1206, can effectively prevent this drug destruction process and enhance cancer killing by binding to a molecule called FcγRIIB. BI-1206 showed remarkable success in mice in overcoming resistance to monoclonal antibodies like rituximab, currently used to treat different types of lymphoma and leukaemia. The study, led by Dr Ali Roghanian and Professor Mark Cragg in Southampton and Dr Ingrid Teige and Professor Björn Frendéus in Sweden, represents a six year endeavour into how to improve antibody therapeutics for blood cancers. The new drug will now be tested in patients with chronic lymphocytic leukaemia and non-Hodgkin lymphoma in an early stage clinical trial. The trial will test safety in humans and if it has any anti-cancer effects when combined with rituximab. This is a new collaborative venture between Leukaemia & Lymphoma Research, Cancer Research UK and its development and commercialisation arm Cancer Research Technology, aimed at accelerating the delivery of promising new treatments into blood cancers. 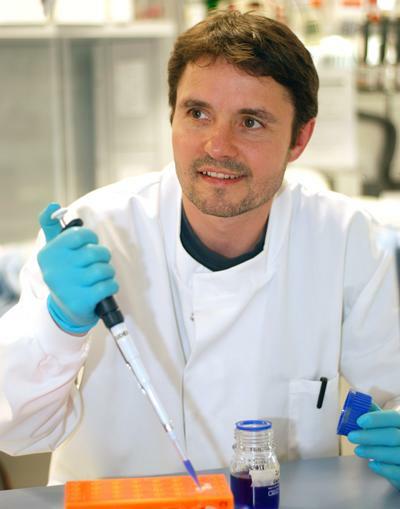 Björn Frendéus, Ph.D., Chief Scientific Officer of BioInvent, and honorary Professor at the University of Southampton, said: “BI-1206 binds very specifically to the inhibitory FcyRIIB, a receptor that acts as a brake to dampen critical anti-cancer immune cell’s function and to eliminate therapeutic antibody from the targeted tumor cell surface. Emma Smith, senior science information officer at Cancer Research UK, said: “This exciting research has the potential to be a game-changer for people with white blood cell cancers that don’t respond, or have stopped responding, to treatments like rituximab. It could also make immunotherapy for other types of cancer more effective too.